The port side cabin on Britannia was an odd layout, which I could only flatteringly call a “traditional” concept. The bed configuration was ridiculous! A large 36” inch wide by 19” inch deep section had been cut out of the bed to make into a seat, with an infill similar to what is often used between vee births in a fo’c’sle. But when this was used as a seat the actual bed was an absurdly narrow 12” inches wide in the middle! This meant the infill had to be in place all the time the bed was used, and hardly ever just as a seat. Another reason the bed was so narrow was the row of four lockers along the side of the hull. These were pokey little spaces with doors which could not even be opened when the bed was made because they opened flush with the mattress. Above these was a shelf edged with pin-rail which looked very nice, but there was only 4” inches between the pin rail and the turn of the hull to put things on the shelf. This was also the only one of our three cabins which did not have a hanging locker. The 120 volt AC power socket. was at the foot of the bed and difficult to reach. It was an altogether impractical and badly thought-out cabin layout, but I had become used to this as I worked through renovating and modernizing Britannia. In so many places it was as though the designer and builders had little practical boat knowledge or even simple ergonomics. The first thing I did was dismantle the side lockers. I removed the full length pin-rail from the shelf by drilling out twenty teak plugs and stainless wood screws, (it was only 80” inches long!). I did the same with the locker doors and their framework and removed the whole lot. This widened the bed space by 8” inches all along its length and had the immediate effect of making the cabin seem larger. 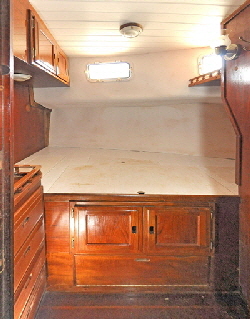 The original vinyl covering on the sides and ceiling was faded and torn in places, so I stripped it all out with a box cutter, exposing the hull and underside of the deck. This entailed twisting out literally hundreds of staples by hand with long nosed pliers, spaced about one inch apart which fastened the vinyl to the side and ceiling. It has never ceased to amaze me how many screws and staples were used in the construction of this boat—in many instances dozens more than necessary. No wonder Britannia came in at twenty tons! To re-cover the cabin sides I bought two 4’ feet by 8’ feet sheets of Plas-Tex plastic (PVC) paneling from Lowe’s Hardware Store. This is 1/16” inch thick and very pliable, waterproof, washable and easily trimmed with scissors or a box cutter. I have used this material throughout the boat to replace all the tatty and faded original vinyl side panels. I removed the two portlights, then made templates of the upper and lower sides using art board from Wal-Mart. Making throw-away templates is a bit tedious, but it is the only way to ensure an accurate fit on a boat, with its many angles and hardly ever straight edges. What seems straight on the boat can be very irregular and it is often amazing how a template looks when lying flat on the ground. I transferred my templates to the plastic sheets on the marina dock and cut them out, then glued them to the side of the cabin with contact adhesive. For this I prefer the gel type adhesive which doesn’t “string” like the regular stuff—which is handy when gluing upside-down. I made “props and boards” to hold the underneath part of the side in place while the glue hardened. Replacing and recaulking the ports also helped to hold the new covering in place. The original lighting for this cabin was also totally inadequate, being just a single 12 volt DC dome light and a small reading light in the corner. Before fitting a new ceiling to the overhead I wired a second dome light in with the original. I also installed two 120 volt AC sconce lights on the walls, wired into the boats 120 volt ring main. These pretty little inexpensive lamps came from Lowes Hardware store. I connected both sets of lights through a twin rocker switch mounted near the door. This is a regular household double switch from The Home Depot store which can be completely isolated, one rocker from the other by snapping the bridging connection. I wired the top rocker to the 120 volt AC sconces and the bottom to the 12 volt DC dome lights. Wall switches near the doors are much more practical than groping in the dark for the tiny overhead dome light switches. The lights can now be switched on and off from the wall switch, or individually from their respective lamp switches. While rewiring the lighting I also installed a twin 120 volt AC power socket. The cabin was now beginning to look a lot more functional and clean, but there was still the bare overhead ceiling to deal with. 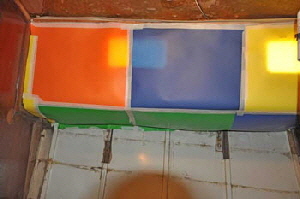 To re-cover this overhead I used tongued and grooved plastic (PVC) boards which I have used throughout the rest of the boat. (see New Headliner) It is called Plank Paneling and designed as waincote panels for houses. Each board is 7” inches wide, 1/4” inch thick and 8’ feet long, available from Lowe’s hardware stores, three boards to a pack. One side is molded with two strips and the other with three thinner strips, and I used the two strip side. An important benefit on a boat is the rot and mildew free lifetime guarantee, along with the ability to clean it with soap and water. The thickness also gives better thermal insulation through a hot deck than thin vinyl material. Each panel had to be measured and trimmed individually to account for the taper of the cabin ceiling, then secret nailed with stainless brads to the existing wooden beads which had supported the original vinyl. The dome light screwed into a piece of plywood embedded into the ceiling which helped to secure the new ceiling panels. With 6’ feet 8” inches headroom the cabin had plenty of height, so I decided to reposition two of the original locker doors and frame above the bed head to form a large storage locker. I cut a base from a 1/2” inch sheet of plywood and supported it with battens screwed to the bulkhead and sides. I also glued a sheet of teak veneer to the underside and varnished it to match the bulkhead. Then I fitted two of the old lockers to the front to make a large storage space which did not impede the bed in any way. My wife didn’t want any dividers in the space, to give maximum access for bedding and pillows she wanted to store in this large dry area. It has more cubic capacity than all four original side lockers and very much more accessible. I fitted the new dome light where it can be switched on and off when in bed. I didn’t want the silly seat infill at all, so I took it to pieces by twisting out another pile of staples in the plywood base to get to the foam inside. Next I totally dismantled the seat support framework, exposing a large space which was just too big to be left unutilized. After fitting a base in the bottom to cover the heavy wires passing along the cabin floor I hinged the original panel below the seat with a piano hinge to allow it to open downwards. I then mounted the other two original locker doors and frames above this and installed a shelf. My wife had the brilliant idea of simply hinging the plywood top flush with the bunk boards, to allow total access from the top for larger items. The edge was finished off with a straight teak fiddle. In total this modification added more than ten cubic feet of storage under the bed, Along with the lockers above the bed this added a massive thirteen cubic feet of extra storage. The bed was now much larger, but I was still determined to squeeze as much extra space as I could for it. 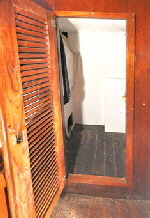 A two foot deep locker protruded into the cabin with an access door in the fo’c’sle, which I used as a Bosun’s locker. I tapered the back and gained another 5” inches of width at the foot of the bed. 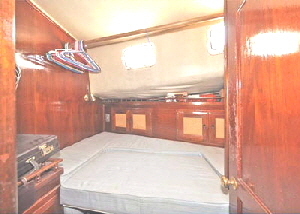 With 8” inches gained by removing the side lockers, plus 5” inches from the bosun’s locker, the foot of the bed was now 12” inches wider. Every little bit helped. The cabin still had no hanging locker, so I decided to transfer everything from my bosun’s locker into the new space under the bed. I then removed the three shelves in the bosun’s locker and fitted a louvered door into the cabin—left over from remodeling the forward head. 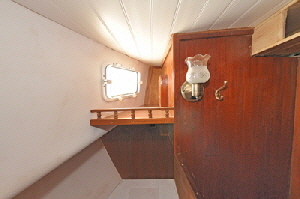 This large hanging locker can now be accessed from both the fo’c’sle and port cabins. I also fitting a shelf at the end of the bed, just below the port light, (having first made a template of course), and faced it with pin rail. Kati had previously removed the cover from the bed foam to machine wash it. I glued the original seat foam inlay permanently to the bed foam with contact adhesive, along with extra foam to infill the space gained by removing the side lockers and at the foot of the bed. This enlarged sheet of foam was just too unwieldy to handle in one piece, so I cut it in half. Then Kati made completely new covers to form a bed measuring 54” inches wide at the head, (US double), 27” inches at the foot and 81” inches long. Something which is rarely mentioned in projects like this is the time and patience it takes to “finish” the trim. This is especially time consuming when re-using much of the 35 year old original wood as I did on this alteration, and indeed all the rest of the boat. The original lockers and all the teak-faced plywood had multiple layers of varnish which looked like they had just been slapped on top of each other over the years. This had to be stripped to bare wood then re-varnished to make everything look uniform and presentable in the new construction. For this I used nearly a gallon of Goof-Off semi-paste paint stripper and a lot of elbow grease. I glued more than fifty teak wood plugs into recessed screw holes, shaved them smooth and varnished them to match the surrounding wood. The Plas-Tex plastic sheets on the cabin sides needed the edges trimmed, which I cut from surplus teak strip and varnished. It also took two whole days to cut, varnish, and fit trim round corners and joints, which I had not quite managed to match as accurately as I liked. It took a complete gallon of white gloss to put two coats of paint on all the new shelves and the inside of the hanging locker. This finishing off process took nearly as long as the alterations. The cabin has now been completely transformed and is much more ergonomically viable. It was well worth the effort and makes an excellent sea-birth, being amidships and subject to very little fore and aft movement.